First anniversary gift ideas are traditionally made from paper and with this being your 1st anniversary you will want it to be special, romantic and very personal! There are lots of gift ideas that you could make from paper; collages, pictures, and cards are the most obvious and another idea is Paper Mache. You are probably at this point thinking of those masks that you made at kindergarten but don't worry paper Mache has come a long way since the days of balloons, wallpaper paste and last week's newspaper! Stunning objects can be made from paper Mache. You could use your initials and add an "&" and paint them in your favorite colors, you could have them displayed maybe on your fireplace or in your bedroom. 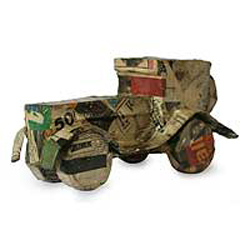 Modge podge with decorating paper is really popular at the moment as a way to decorate papier mache items. This would be a cute reminder of your 1st anniversary, especially as they are made from paper! 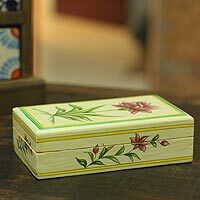 These are a beautiful gift for your 1st anniversary and one that your wife could use as a jewelry box or your husband could keep his cufflinks. You could maybe even have a beautiful piece of jewelry in the box to make your gift even more special, or you could fill it with 365 love notes, one for every day of the year. Your 1st anniversary is also about fun and there are lots of fun papier mache sculptures at Novica, all of which have been handcrafted. If you have promised to buy your husband or wife a car one day you could surprise them on your 1st anniversary with this cute one. Origami heart and if you have a nickname for each other that could be made with origami create one of those too. Buy a diary, the ones without the year on and write a reason why you love them on all 365 pages, one reason for every day you have been married. Create your own board game just for the two of you! Treasure hunt with paper clues and a map leading to where your anniversary picnic or party is. 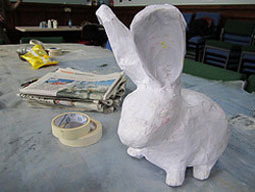 To make paper Mache you will need newspaper, white flour, water, masking tape, and paint. Mix up the flour and water into a paste, add the water gradually so you control the consistency, the thicker it is the stickier it will be. You can bring the mixture to boil which will result in it drying clear or you can mix this together cold. Both will work in pasting everything together. Next create your structure, if it is a heart then 3 balls of newspaper scrunched up and taped together to make the rough shape will work well. 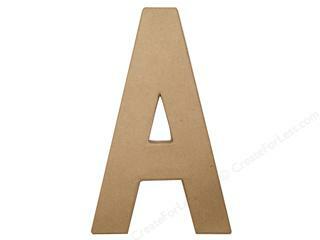 If you want your sculpture to stand up then you will need to attach a cardboard base so that it is flat. When you are happy with the structure it is time to add the paper Mache. Rip thin strips of newspaper and dip them into the paste that you have made and then wrap around creating smooth edges and enhancing your structure. When you are happy with how it looks you will need it to dry completely, otherwise it will go mouldy. Near a radiator or in the airing cupboard would be perfect if you are not lucky enough to have sunny weather when you are making your masterpiece. When your sculpture is completely dry you can paint and varnish it. You will be amazed how hard it will be and your husband or wife will love the time and love you have put into this first anniversary gift ideas.